Standup paddle boarding (SUP) originates from the Hawaiian islands and is quickly becoming one of the fastest growing water sports in the world! SUP offers a unique glimpse of the ocean while giving the paddler a great core workout. Unlike surfing, SUP, can be mastered by anyone with a little balance in under an hour! 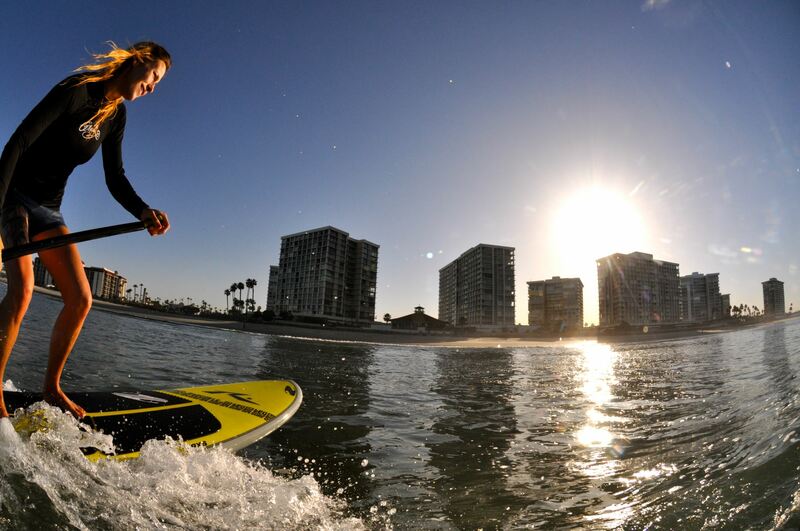 Head on down to OEX La Jolla and paddle the best spot in San Diego! Want to get out and Paddle Board? You can! Comment below for a chance to win SUP Rentals for 2 with OEX La Jolla. Winner will be chosen on Friday, June 22, 2012 at 10:00 am. Summer has never been so bodacious! This entry was posted in Golf & Sports and tagged la jolla, north county, stan up paddle board, summer, SUP by Brent Bernasconi. Bookmark the permalink. Such a fun sport! The first time I ever went, I jumped on the board and *bam* complete wipe-out lol; but as soon as I got my “SUP legs” it was just awesome. Killer workout and relaxing, my new favorite sport. Been waiting for an opportunity to try this! My family loves SUP’s and we have an inflatable one that lives at our house in the Adriatic Sea so we would love to try it out here on the Pacific! Congratulations Tanya on winning SUP rentals for 2 with OEX La Jolla! Get out there and make us proud! Thanks for the free rentals for 2…Hope us Texans can make you proud. Yes! I’m in let’s go paddle boarding! I would love to try this and challenge myself and see if I can stand up on a board. My husband and son want to buy a paddle board so bad….it would be nice to try out first!!!! Definitely wanna try this out! Definitely one for the bucket list! I want to try stand up paddle boarding!! I love San Diego! I hope it will be my home someday!!! I always wanted to try this, it looks like so much fun! I so want to try paddle boarding. I just watched paddle boarders and was thinking how fun this would be! Always wanted to try it! Pick me pretty please! What a wonderful way to take in out beautiful coastline ! Never tried it, and I’m going this summer it comes off my bucket list <3 ! I’ve always wanted 2 try standup paddle boarding! Awesome. Will be there next month! I can’t swim but oh well! I’ve seen sooo many people doing this……never tried it but looks really fun!! I love water sports and would love to try this! I went paddle boarding in cabo. It was so much fun! I’d love to see what la Jolla has to offer! We lived in La Jolla for almost 2 years (until last week, we moved a little further north) and never got the chance to do this. I’d LOVE this – when the kids are gone this summer at grandparents camp – my hubby and I need to take advantage and finally get off our lazy butts and do this! I want to win! I haven’t paddled since last summer! Would love to try this out!! Will be there in the summer time and this would be awesome to do!!! I’m coming on vacation next month, this would be so much fun! this sounds soooo fun!! would love to try something new this summer! Never been. I want to take my brother and sister when they visit in August! Oooooooo!!! I have never heard of Stand Up Paddle Boarding?! Sounds Exciting! We’re visiting San Diego later this summer and love paddleboarding. I’d love to surprise my husband with this. Fun, this would be my first time SUPing! Will be heading to San Diego for the first time in July! I love stand up paddle boarding in Austin, and would love to try it in Cali! I don’t know how to surf but I think I could handle paddle boarding. Thanks for the opportunity! Board looks like so much fun. Love to try this out with my hubby- just moved back to SD. Cheers. I’ve been wanting to try this for so long!! I would love to win. I would love to try stand up paddle board. It looks like a lot of fun. I’ve heard about how great this is from friends – awesome experience and workout. I’d love to try! My family in Hawaii keeps telling me about this but I haven’t been able to try it yet! It looks like a lot of fun and I can’t wait to try it out. Wow, La Jolla SUP. That would be so awesome. PICK ME PICK ME PICK ME PICK ME PICK ME PICK ME PICK ME PICK ME PICK ME PICK ME PICK ME PICK ME PICK ME PICK ME PICK ME PICK ME. We’ll be there next week to try it. My boyfriend and I are coming out to vacation in San Diego. We’d LOVE to get the chance to do this!! What better place to stand up paddle board than La Jolla! Thanks for the chance to win! I have yet to be able to stand up for more than a minute so this would be some good training for me. I have a friend visiting from cancun and he showed me how to wind surf and use a catamaran… I’d like to show him how we do things in beautiful San Diego!!! He flies in tomorrow and his Birthday is actually on June 24th! This would be perfect!! Cancun is nice but San Diego is beautiful all year round!! Yay I’m excited as well for this oppertunity to try something new!! Paddle Boarding would be a perfect way to enjoy summer! I have never paddle board before would love to try! I want to play in the waters of the Best Coast this Summer. winner winner chicken dinner after i paddle board!! Just moved here from AZ and would love to paddle board! Thx! This looks like so much fun!! I would love to do this. And what a good workout!! Been dying to try this – would love the rentals! !